You see them, falling to the ground, kneeling in the gravel. And there’s noise all around, but the ringing is somehow breathtakingly silent. The people around you that are the strongest become the weakest. You don’t realize it fully in that moment, but, they can’t take care of you anymore, it’s your turn now to take care of them. You never imagined it to come so soon. And like this. Grief, something you have never known before somehow becomes something you will know like the back of your hand for the rest of your life. It becomes a look on your family members face that you can recognize instantly. A drooping mouth, or far-away gaze lets you know that they’re thinking about him. Depression, it’s a hollowness you know all too well, because you too have experienced it. You’ve seen those features in your own mirror, in the bathroom, in the car, in the middle of a night out when something reminds you of him, and you thought you were okay, but you’re not okay. But you have to be, right? For them. For the ones that you have to take care of now. That you have to be strong for. For the little girl who was three at the time, but just celebrated her first double digit birthday. For the grandparents that have and will be your favorite people on the planet, forever. And for your mom, who you know is playing the same strong game, but, has lost every ounce of faith, and can’t quit asking God why. Seven years, that’s how long it’s been since the ringing. The call. The moment we all changed. “It gets easier with time,” that’s the way the saying goes. But, I don’t know. It seems to intensify for me. We move on, sure, because we have to. But as the years pass, as I age, my responsibility to take care of everyone, it grows. The understanding of hurt, it’s become clearer, and therefore, I go through the process of it, again and again, with some hope that this time I’ll find the answer for us all. But, there is no answer, and that’s what keeps us here, stuck. There has to be a lesson, or a purpose, something. I’m laying here in bed at 5am, thinking not only about this day 7 years ago, losing my uncle, but also about my friends suffering loss in present time. The sting of grief is fresh for them. The ringing just started. Suddenly I’m their counselor, their stability, their late night message for help. I have to be strong for them too. Grief, it’s a vicious cycle. It’s a daily reminder that we just have to be here for each other. Even when times are tough. Even when we don’t think we can. It asks us the question, were we there for them enough? Those that we’ve lost. Suddenly the memories start flying, conversations arise, stories are told, and we remember how great they were. Those are the things we have to remember, so we can survive. Again, we have to be there for each other, no matter what. We have to say I love you, I miss you, I need you, I hear you, I see you, any time we think or feel it. The day he left, I vividly remember him walking out the door, I remember the urge I had to hug him and tell him I loved him. We aren’t really the hugging, affectionate type of family, so, that would just be weird. I actually remember thinking that, that it would be weird, to hug my uncle goodbye. I wish I would have. That I would have known it’d be my last chance. Maybe it would have saved him. But, I also know that he knew I loved him, our bond was strong, and that’s the part I have to hang on to. That’s the part I have to remind my struggling friends and family of. When the regrets or things we didn’t do, words we didn’t say become too strong, we have to shut them down and cover them with all the things we did say and do, the laughs and good times. That’s what keeps us going. Grief and depression, they can sneak in and steal us if we are not careful. But, we have to be strong, not just for all of those that we want and need to take care of, but for ourselves. We can’t cover hurt with hurt and expect a better outcome. Find someone to talk to. Find someone to be there for you. Talk to someone, be there for someone. For the love and life of this world, let’s take care of each other. Let’s stop being afraid to love each other. Love hard and without apology, out loud. Let’s be better than okay. I’m finding myself caught in a web of too much and never enough. Although complete opposites, I always seem to be standing smack dab in the middle of one of them. You know when you’re at a party in which you really don’t know many of the guests, but, you don’t want to seem like a fuddy duddy so you start telling really bad jokes or stories, and all of a sudden everyone is looking at you like, “who invited that chick?” It’s kind of like that. You walk in feeling not enough, like the uninvited guest, so the only logical solution is to be a little too much, that way people at least know you are. The problem is, I’m not feeling that way at a party with a bunch of strangers, I’m feeling that way in the midst of my very own life. The devil has a funny way of grabbing hold of our weaknesses and running with them. In my case, that weakness is anxiety. Something not many like to talk about, or understand to be a serious monster. But for me, once he takes off running, I see that flaming torch in his hand, and I have to start chasing. And there I am in a whirlwind of self wallow, insecurity, and state of feeling too much and never enough. One little problem turns into a million big worries. A bad joke at the party spirals into never being invited again. It’s exhausting. The thing of it is, trying to be everything for everyone while at the same time being nothing to yourself is not a healthy habit. I like to be the “go-to” girl. The one everyone trusts with all their problems, or their kids, or their money. But, sometimes, you have to be your own “go-to” girl, and if she’s telling you that you need to slow down, make time, take a breath…well, I’m sorry sister, but your going to have to do it. Or you’re going to be stuck there too, in the too much, never enough web. It’s hard when we start growing up, and our seasons people are changing. We start feeling hurt, or left out, but, in reality, the leaves are just blowing to their new homes, and our branches aren’t needed to hold them anymore. I’m the type that keeps running trying to catch them all, in hopes that my super glue will hold them on forever, but, sometimes it just doesn’t work that way. The truth of it is, you should never be too much or never enough to anyone, including yourself. So, when you start feeling that way, pray about it, talk about it, but, do not be overcome by it. Drop the hot glue, or you’ll only end up getting yourself stuck in the web. You deserve the very best. And, rest assured, when you find it, there will be lots of laughs at your bad jokes and pointless stories. Receive it. I have recently found myself in a state of ugly. I say recently as if it is a new thing, although, really what I mean is that I have finally started to see it. The ugly within myself. That may sound harsh, it probably is. But, wouldn’t you want those closest to tell you if you were being unpleasant? This is me looking in the mirror, telling myself. I’ve spoken briefly before about the mentality of a rejecter. The refusal of accepting things to be good when they are good. The refusal of accepting love, even when it’s freely given. The refusal mostly of just seeing things and believing them. This mentality puts me in a state of not feeling like myself, or not feeling okay, with no real reason. I’ve felt it creeping back around. And it is so detrimental to living a healthy, happy life. You see, whenever you are the victim of the rejecter mentality, you form a habit of being just that…the victim. But, I’m not. Or, I shouldn’t be. What I’ve noticed lately is how bad my insecurities are fogging my vision of other people. How they are playing the devil on my shoulder, whispering in my ear that I’m not good enough, and it must be someone else’s fault. People I don’t even know have become “threats” to me. These insecurities are creating scenarios in my head that are being absolutely destructive to already existent, and future possible relationships. It’s so ugly. Ugly. That’s the word I used to explain to a second grader the way she was acting. “That’s ugly, and no one wants to be ugly.” Yet, here I am, preaching to the choir while drinking from the jug in the back row. It’s so unpleasant. How terrifying to think that someone could be thanking their lucky stars that they are not me in a situation. That they could feel as though my ugliness was spread towards them because of an insecurity, and that they would never want to possess those traits. I don’t know what it is. I can honestly say that immediately after ugliness or bitterness in most situations, I feel horrible. I want to apologize to the people I have acted ugly towards, or even thought ugly thoughts about. I so often advertise the importance of being good to each other. Of empowering all of our fellow women in their strengths and weaknesses. Picking each other up when we fall. Telling all of our stories because we all have so much to learn from each other, and such an opportunity to grow. I guess I’m saying this all because I almost feel guilty. Like a false advertisement. Here I am advertising all of this stuff about self-love and loving one another, all the while I am full of bitterness, jealousy, and resentment. I’m saying this all to say that if we allow it, all of these things will steal our joy, our happiness, and the promises we have laid out for us. It’s a hard sting, but, it’s time to open it up, air it out and let the healing happen. These are the words Jillian Paige encourages us all to hear. Though she has always been an advocate of positive thinking, it wasn’t until devastation hit a little too close to home that her belief in those principles was tried. The loss of her husband, though devastating has taught Jillian the importance of experiencing life moment to moment. She has continued to use this method as an outline for healing and the continuance of pursuing her dreams. In describing a favorite role, Jane from the musical Tarzan, Jillian states, “Jane is such a fearless adventurer, fierce independent, and open-hearted love to her father and Tarzan. I learned a lot from what I thought was going to be a fluffy role.” In that description, I can’t help but note those same qualities in Jillian. Further exhibiting these characteristics, Jillian doesn’t stop at only acting, but is also a Certified Personal Trainer. With such a demanding schedule, what keeps Jillian motivated? In speaking with Jillian, that Arete style of living, and positivity radiate from her. 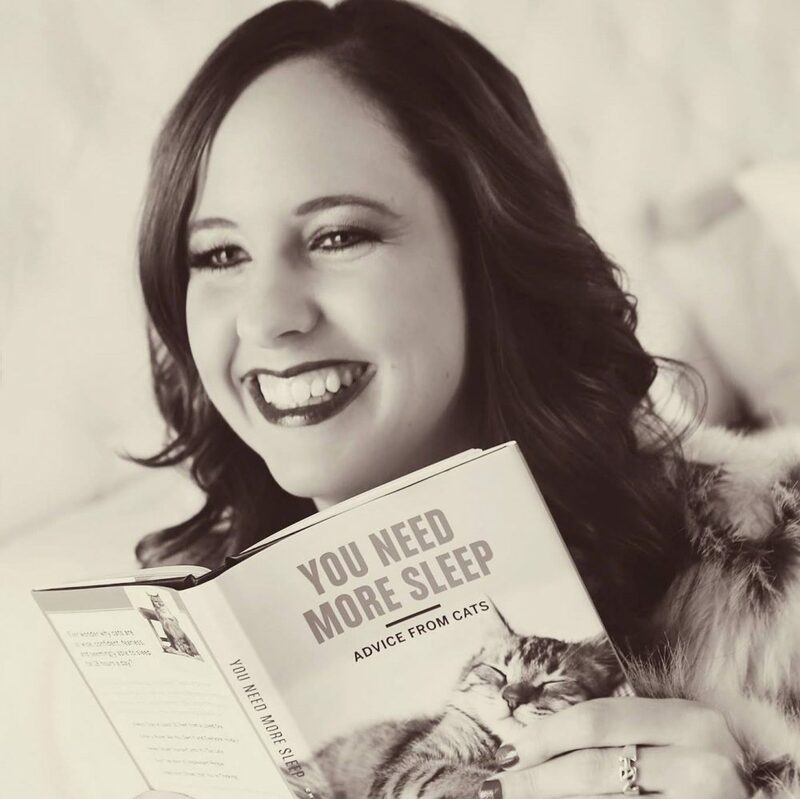 Though in a brief description of herself she claims, “I am now a cat lady who sings and has a love of spirituality and self-improvement books,” Jillian Paige is so much more. I see a “she who dares” woman who shines brightly, and helps others do the same! Keep sparkling sister, I’m cheering for you! A quick workout suggestion: Tabata – (20 seconds on, 10 seconds off for 8 rounds) Legs: one full tabata roud each of squat jumps, walking lunges, alternating jump lunges, and reverse lunges. Top picks on Jillian’s workout playlist: Lizzo, Jess Glynne, Charli XCS, and Kehlani. When talking to people about Hanson, I often used to say, “if only they could see them as more than the boys who sang ‘Mmmbop.’” But, as I’ve grown, and continued to listen, I’ve changed that statement to, “if only they could hear ‘Mmmbop’ for what it truly was and is.” A chillingly accurate story of life managed to somehow be told better by a group of children than most of us as adults could muster up to explain. Simple, but profound. How often do we struggle with holding on, and letting go? Relationships in various forms are the strike up of so much conflict and discussion in our adult lives. We overanalyze, over discuss, over complicate scenarios that could so easily be solved with that one statement. Yet, “those girls that sang Mmmbop” have continued to be criticized twenty-five years down the road. Just another talent less boy band. But, by gracious are so many people missing out on phenomenal music. In trying to form a way to put it into words how Hanson has continually had an impact on my life, from age 9 to 31, the best I can come up with is that they have kind of been a “self-help” book on relationships. Hear me out. It’s not uncommon for people to get divorced, right? Though there is a sea of reasons, a common one seems to be that people “get bored.” They outgrow each other. One spouse becomes boring and never changes, or the other one changes too much, leaving you wondering why you ever fell in love to begin with. Right? So there has to be balance. A knowledge of when to change things up, but, also knowing when to circle back around and remember where you started. In following the evolution of Hanson, there’s been so many different outlets. A genre is almost nonexistent, because each album has its own distinct sound. But, there is always that little thread that pulls you in, that makes you say, “oh yes, that’s Hanson.” But, with a little spice when necessary, and a little sugar to keep things sweet. Yet, there is always that circling back. That moment of, “let me remind her why she fell in love with me” moment. But, in true Hanson style, with a twist. That twist…the newest record. String Theory. With this record, the guys basically give us something old and something new…but at the same time. The songs that made us fall in love, like “Mmmbop,” “Where’s the Love,” and “This Time Around” are re-invented, all with a symphony orchestra backing them. But, not to leave us hanging, there are also some brand new tunes to raise our spirits. For me, it will never stop. Hanson has so strongly taken me through the highest and lowest points in my life. With lyrical brilliance, resilience, and pride. Pride in taking risks, and creating art that can take us all on a journey. I’ve said all of this to lead up to this statement…. Go buy Hanson: String Theory. If you’re a lifelong fan, I know it’s already in rotation, and I hope hearing these songs differently reminds you, as it has me, of why I fell in love with this band. And for those of you who have yet to discover the music, I simply ask you to give it a try. Have an open mind. Fall in love for the first time. Do you ever sit down and think about the power of proud? The importance of not only achieving things that make other people proud, but also being proud of yourself? Oddly enough, for as much as we crave for others to be proud of us, it is even more challenging to be proud of ourselves. It’s almost as if our own state of proud relies heavily on whether or not someone else is satisfied with our accomplishments. It is only in those moments that we achieve the fulfillment. I’ve recently been re-watching The Office. I came across an episode in which Pam, who is “just the office secretary” decides to showcase some of her artwork at her very first school art show. I relate very much to Pam, in that, I am kind of bad at not only believing in myself, but also taking compliments, or believing them whenever they come from other people. That’s what makes showcasing talents, such as sharing writing, so hard. Even in the moments that I feel proud of my work, it’s hard for me to believe that someone else is too. Or that maybe my talents are not comparable to others. Anyway, back to Pam. So, here she is at her art show, a show that she has invited many of her coworkers and friends to attend. As she is looking around, she notices that most of her classmates are talking to people, showing their work off, receiving compliments, and altogether living in the moment of proud. Yet, she is standing alone, staring quietly at her own work, wondering if it is good enough. She is finally thrilled when looking up to spot her boyfriend walking towards her, but, her excitement is quickly deflated when he takes a quick look and then exits, with no real encouragement, or even a pat on the back. Things only get worse when she overhears Oscar and a friend talking very negatively, even using the term “uninspiring” to describe her work. In these moments, Pam is as far from living in that proud moment as a person could be. She is feeling defeated, and automatically assumes that she should just give up art all together. Michael Scott enters the room. And, if you’re a fan of The Office, you know that he might be the last person you expect to be serious enough to truly inspire. Yet, he looks at Pam’s artwork in a state of awe. “You did this?” He asks her. “Wow!” he exclaims. “This is incredible.” Pam smiles, nearly tearing up, looking at Michael. “How much?” He adds, wanting to buy a piece of her work. Pam is shocked, thrown off even. “You want to buy a piece of my art?” Everything changes. The camera fades out, showing Pam glowing, looking truly accomplished. Proud of herself. That is the power of proud. Despite the negativity that surrounded the night, that moment of Michael being proud truly inspired Pam to not give up on her dream. I can’t explain it, but, it is so hard for us to tell people that we are proud of them. Perhaps it is that we are afraid of how they will respond, or that we may sound silly for overusing the statement, “I am proud of you.” I think it may be one of the most important sentences that we encounter in our lives. Do you remember being little and just wanting your parents, teachers, loved ones to be proud of you? I can remember the hanger in mouth smile that would cross my face if my parents told me they were proud. Yet now, when someone tells me they are proud, I almost feel embarrassed, like I shouldn’t show my excitement. A short “thank you” and a blush tends to be my response. But, why? I think that circles back around to the being proud of ourselves struggle. We need to learn to stand tall in our accomplishments, to be truly happy no matter how small they may seem. If I share a story that only inspires five people, three people, one person…that is still a story worth telling. I’ve read some interesting stuff lately about things such as blogs, podcasts, newspapers, websites, etc.., not being beneficial if they don’t get that crowd reach. Of course, the ultimate goal is to reach as many listeners/viewers/readers as possible when starting such a journey. But, should we quit if we don’t get that response? Should we lose the proud because we aren’t reaching hundreds or thousands? I don’t think so. Unfortunately, everything seems to be measured only by numbers. Even our social media…especially that. We are constantly checking to see how many likes we have, and if it’s not enough, we are not enough. How do we measure proud? How should we? I think we’ll all have our own answers, but, one thing we should agree on is the power of sharing the words “I am proud of you.” Whether that be to our loved ones, or looking in the mirror. I don’t think we truly realize the impact those five words can have. We need to pay attention to those around us, notice what makes them feel proud. We all have different areas in our life that need encouragement. Something insignificant to us can be so big to someone else. The power of proud comes in to play when we pay attention to each other. We need more of that. I remember getting asked that question a lot, and often times could come up with a lengthy list of things that I would change, without a doubt. There are plenty of words I would put back in my mouth, and others that I didn’t say, that I would have, had I known it was my last opportunity. People I would have given more of a chance, and those I could have spared myself from. Not to mention all the bad haircuts. But, growing to be what I’d like to think is wiser over the last few years, I question completely if I would change any of it, even in the smallest capacity. It’s funny how inspiration can come from anywhere. In this case, my thought wheel began spinning while watching an episode of Star Trek. In the episode, titled, Tapestry, Captain Picard is seriously injured, and on the brink of death. During this time, he is taken on a journey throughout his life and career, and given the opportunity to change moments and situations in which he thinks he failed. “If you want to get ahead you have to take chances…” this new version of Picard is told, upon realizing that his responsibility is much less now, his job, not as fulfilling. In experiencing this out of body experience, Captain Picard quickly realizes that his original theory, that past alterations would greatly impact his future, is one that he should have stuck to and followed. But, of course, in true television fashion, he doesn’t die. He returns to the life he knew before that experience, coming to the realization that even the terrible things, the mistakes we think we make, end up shaping us, and our futures. But would you? Is the change of the past worth the change of the future? Is becoming the person you could have been worth compromising the person that you already are?